The scheme was set up over 30 years ago in an attempt to reduce the incidence of hip dysplasia in the dog population of Great Britain. It involves X-raying the dogs hips and submitting the films to the BVA (British Veterinary Association) hip scoring panel. Each hip is then scored on 9 different parameters and each parameter is given a score of 0 to 6, 0 being perfect and 6 awful. A total score is then given for each hip. The results are then sent to the Kennel Club and are entered onto the dogs pedigree certificate. They are also included in the vast data base enabling a mean score for each breed to be calculated. Hip dysplasia literally means abnormally shaped hips. The hip joint is a ball and socket joint and the ball should fit tightly into the socket. If it is a loose fit the dog is dysplastic. The condition is genetic, although a number of genes are involved, and it is also developmental in that all pups are born with normal hips and the condition develops during the first few months of life. This is thought to be due to laxity in that the ball is not forced firmly into the socket during the growth period. Hip dysplasia leads to hip osteoarthritis, seen occasionally in the juvenile but commonly in the adult. Osteoarthritis is a progressive destructive condition where new bone is deposited around the joint and the joint surfaces wear out. It is irreversible. The degree of the severity of hip dysplasia correlates to the age at which the osteoarthritis develops. The aims of the scheme are to identify which dogs will develop osteoarthritis and to advise the owners on which animals are suitable for breeding. In many of the popular larger breeds all individuals will have a degree of hip dysplasia and so the advice is given to breed from the dogs with a score well under the breed mean. Unfortunately the answer is not very well for a number of reasons, the main one being that the positioning of the dog does not measure hip laxity. However the scheme is excellent in identifying dogs that should not be bred from, that is dogs with a high score or any dog that already has radiographic signs of osteoarthritis. The scheme fails in that a proportion of dogs with low scores will also have lax hips and this population of dogs will develop osteoarthritis and are unsuitable for breeding. It is mainly for this reason that breed mean scores have hardly improved over the life of the scheme. The PennHIP breed improvement scheme (see below) addresses this issue. How do I get my dog hip scored? 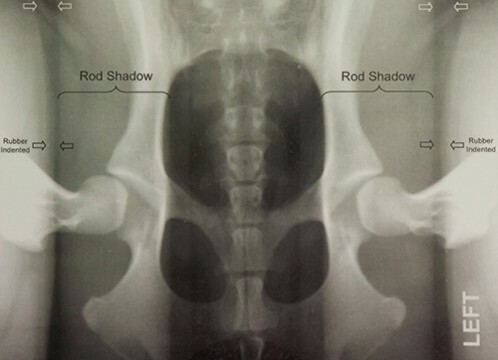 Breeders come from all over the country to have their dogs X-rayed by Tom Gilding at the Nantwich Veterinary Hospital. The reason for this is that Tom is very experienced and guarantees to take a high quality X-ray with good positioning and he will also express his opinion on the likely score. Generally the owners will wait for perhaps only half an hour and, using modern sedatives, the dog will recover rapidly and walk out of the hospital. All dogs have to be over one year of age.